Sacred Center Holds (study); 2013; 18″ x 12″; mixed media: charcoal, watercolor, pastel, graphite. For weeks I watched its stems and leaves unfurl from soil and climb into a lanky silhouette, stretching for sunrise. It seemed to be a flower of some sort, and I was curious for its culminating shape and color to emerge. But when it did, I was surprised. Wispy white tendrils burst from the center. Not a flower at all, but decidedly a weed. Before it even lived, it seemed to wilt. It caught my attention just as it released its first seeds buoyed by a parachute filament. Soon after, violent thunderstorms swept through our area releasing hail and buckets of rain that turned streets into rivers. The fragile weed could not withstand nature’s onslaught. Its crowning glory, that wispy white head, bowed and gave way. 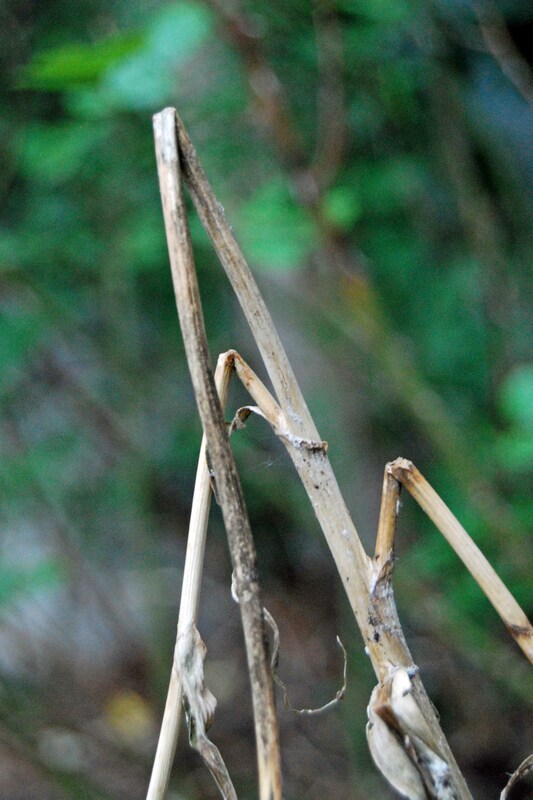 Its stalks, now brown and broken, linger as the only testament that it ever reached for the sun. Its ephemeral presence speaks to me of truth eternal. It grew, it became; it offered its seeds to the world. The winds, the rains destroyed it; even as they simultaneously carried its seeds and deposited them with nurturing moisture. Almost certainly next summer, long lanky stalks will push through soil in other parts of my yard and possibly my neighbors’. And, in fact, if I fail to root them out, they will probably take over. 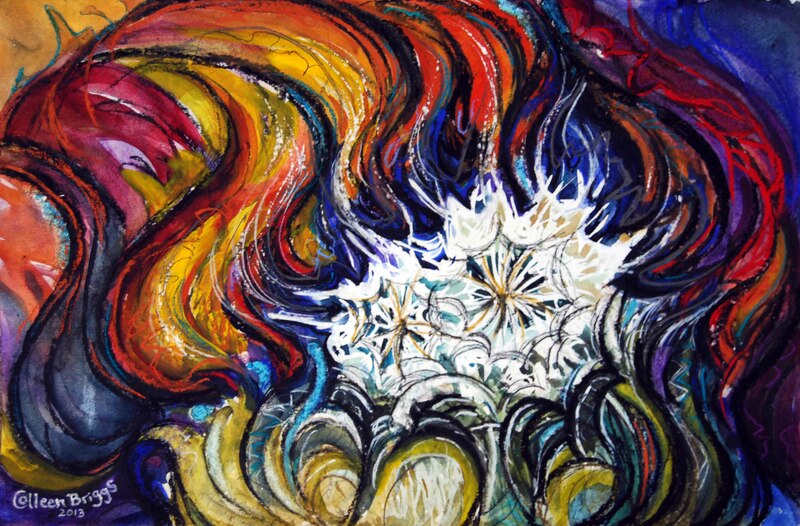 If I could, like the weed, stop trying so hard and simply yield into what I am meant to be, I suspect I would find that through all of this living and dying the sacred center holds: I belong to God, and it is enough. I love the art work. It lifts the humble dandelion to the stature it truly is–one of strength and goodness. It’s a shame we think of dandelions as weeds. They have great nutritional properties and they are bright cheerful flowers. Fun to blow on and make a wish! I like the photograph underneath it too, capturing the moment just as that seed is about to take flight. http://en.wikipedia.org/wiki/Taraxacum Yes! I thought they were world wide as I grew up knowing them in New York and now see them in England. They can get quite tall sometimes especially when one grows on its own. Most people think of them as a nuisance. You make me smile saying its your favourite flower. Hmmm…. I guess “my weed” must just be a different variety of dandelion than I am used to seeing. Around here, they are commonly short and squat with ragged leaves and yellow flowers, which then turn into the white seed parachutes. They take over our urban lawns! Something about this particular variety has captured my imagination. I have heard that dandelions are very nutritious! You have me doubting myself now. 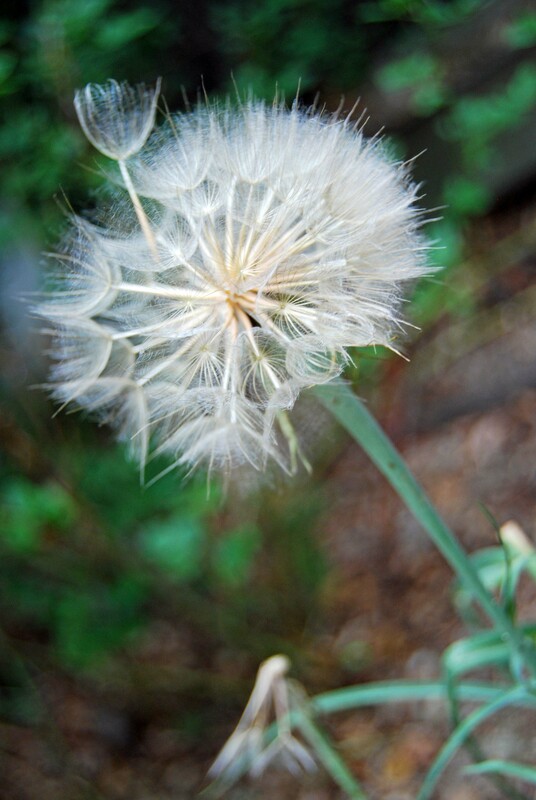 There is another species that is often confused with dandelion called hawksbeard. They look very similar. Often the internet exhausts me – especially online comment forums of stranger upon stranger sniping at each other with inane vitriol. But I must thank you for the above exchange. I love Colleen’s poetry in prose as much as I love the paint poems they’re hung on. I save and savor them as a sort of special treat – a kind of gourmet indulgence, in the midst of an ordinary day. But stumbling across the above exchange – your soft spoken, ever so cautious interchange over the identity of a dandelion… or is it hawksbeard?..has been curiously soothing and delightful. I feel somehow as if I’ve just overheard it while sitting in a small English garden sipping tea on a lazy afternoon as the conversation lapses into long comfortable silences then resumes. And both of you are wearing lovely floppy hats. Blessings to you as you spread your message of beauty!